My RAID Status says ERROR and there are no Rebuild or Synchronize options in View Storage Configuration. How do I rebuild? Rebuilding is the process of restoring data to a hard drive from other drives in the array. This occurs automatically if a disk in an array fails and there are spare disks available for that array. If no disks have been designated as spare disks, you can manually rebuild an array using an available disk. For example, if you have a three disk RAID 5 array and one of the drives fails, you then need to replace the failed drive with a new one, and rebuild the array to re-generate the lost data on the newly added drive. · Rebuilding applies only to fault-tolerant arrays such as RAID 1, RAID 0+1, or RAID 5 Arrays. 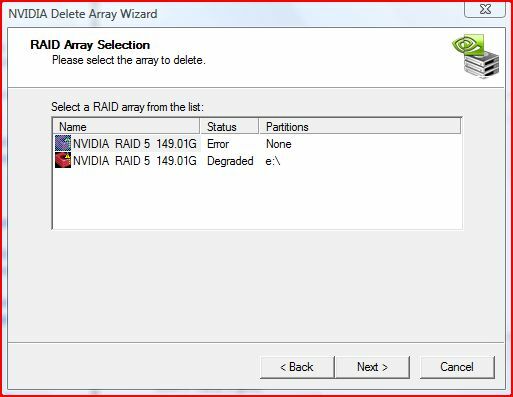 Rebuilding an array works only when using RAID 1 , RAID 0+1, or RAID 5 arrays. Rebuilding does not apply to RAID 0 and SPAN/JBOD arrays. · Rebuilding Occurs in the Background. In the rebuilding process, all data is copied from one hard drive to another and then the data is synchronized between the two hard drives. Because the rebuilding process occurs in the background in a way that does not affect system performance, the process can take some time and the time it takes depends on the size of the drive, system performance and other factors. · Rebuilding applies to a degraded fault tolerant array. You can rebuild a degraded mirrored array using any available Free Disk, Dedicated Disk, or Basic Disk. · Rebuilding limits the minimum disk size for the new disk. The new disk must have a capacity equal to or greater than the smallest disk in the target array. 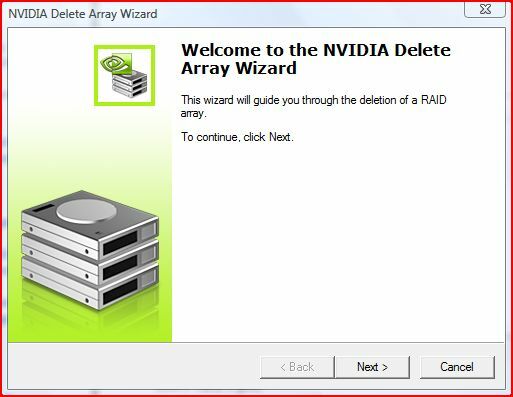 • Choose the Delete Array and the RAID wizard pops up. • Choose the hard drive with the Error Status and click next. • When the drive is removed the Rebuild Process will be automatically started. » Note: To avoid delays in rebuilding your array, be sure to turn off all automatic power-saving settings, such as Standby or Hibernate. The rebuild process is temporarily suspended while your computer is in those power-saving modes. Do not turn off or reset your computer during this process. Please note that motherboard System BIOS implementations may vary. Power up the machine and go into the BIOS by pressing the DEL key. Navigate to “Integrated Peripherals” then “RAID Config”. Verify that the appropriate channels, or ports, are enabled for your RAID. Be sure that “RAID Enable” is also enabled. Once they are set, press F10 to save the settings and exit. When the RAID BIOS utility is displayed, Press F10 on your keyboard. If the RAID is still showing up with an error or as degraded, simply enter the details for the RAID. Be sure to write down the RAID mode and striping block settings. Press “D” to delete the RAID (this will not erase or remove any information on your drives). This will then take you back to the “Define a New Array” screen. 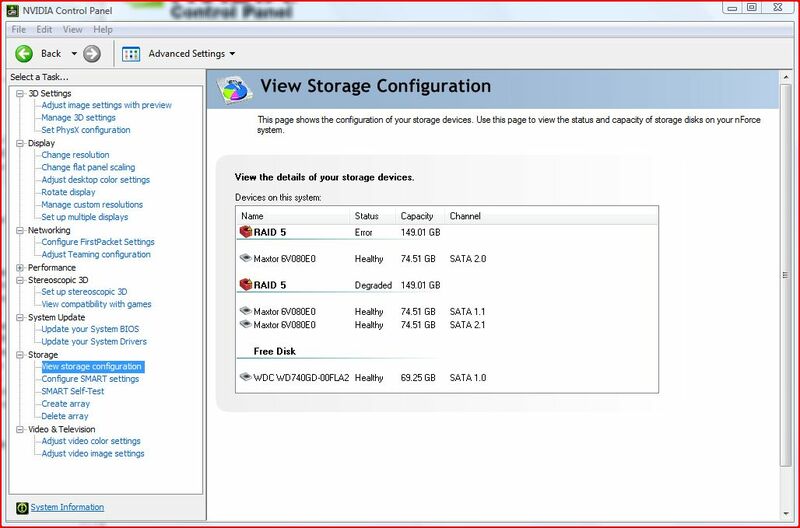 Select the RAID Mode and the Striping Block to what your previous RAID was set to and move the hard drives to the right pane. Press F7 to finish creating the array. Select “No” to clearing the disk and “No” to setting the drives for “Boot”. The array should then say it is Healthy and showing the correct capacity for the array. Press “Ctrl-X” to exit. Thereafter, your Operating System should boot up as normal (if your operating system was part of the array) and the array will start rebuilding.